Editor’s Note: This article has been updated with a correction to reflect that Raintree Partners states there is no record of Lupe Mercado being employed by Raintree Partners. 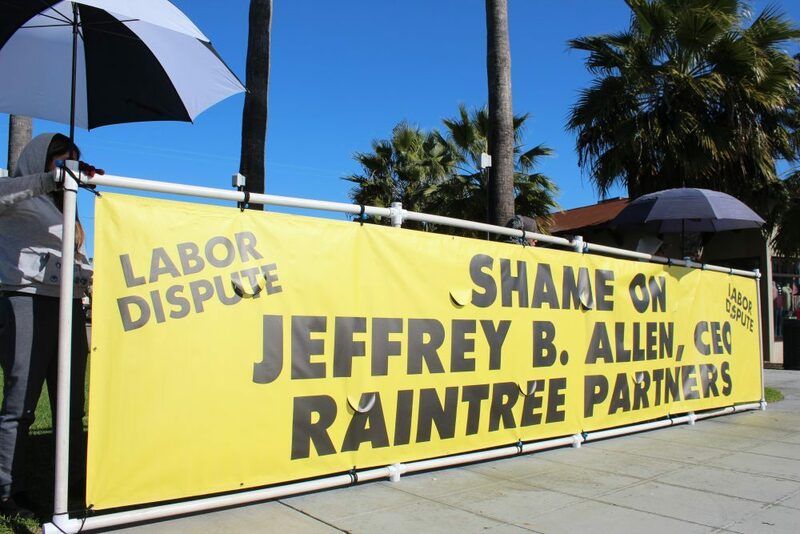 Three demonstrators were seen on Wednesday, Feb. 6 holding up a sign that read “Shame on Jeffrey B. Allen, CEO Raintree Partners,” near La Plaza Park in Dana Point. Lupe Mercado, one of the demonstrators, says she’s been employed by Raintree for ten years. She says the dispute and the sign demonstration has been ongoing for about three weeks. “Raintree Partners has confirmed that Mercado is not one their employees and, in fact, has never been an employee for their firm,” a spokesperson for Raintree Partners said, following publication of this article. The flier goes on to say that the union believes that Jeffrey B. Allen has an obligation to the community to see that area labor standards are met for construction work. “They should not be allowed to insulate themselves behind ‘independent’ contractors. For this reason the union has a labor dispute…” the flier says. Mercado provided contact information for a union representative, but the contact did not respond to Dana Point Times’ inquiries before press time. Jason Check is the Managing Director for Raintree Partners and has an office near La Plaza Park, where the demonstrators held their sign. He says the dispute does not involve his firm directly—rather, it is between a subcontractor employed by the project’s general contractor and Carpenters Local 714. Check says he remains committed to seek projects that will benefit everyone who lives in Dana Point. For updates on the dispute, check www.danapointtimes.com.